Knowing when to bow in Japan can seem daunting for first-time visitors, particularly because bowing isn't so common in the West. 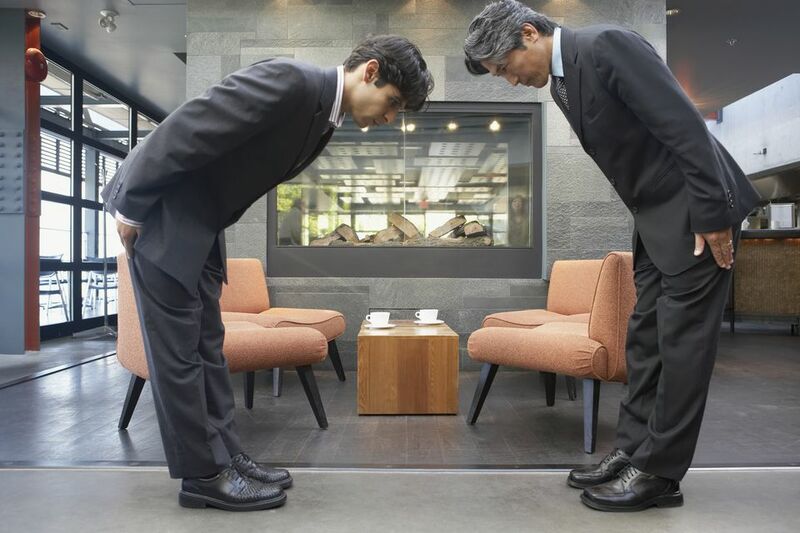 In Japan, great emphasis is placed on executing a proper bow; some Japanese companies hone employees' bowing etiquette — even though people begin learning how to bow from a young age. Watch out: some employees are trained for drinking sessions, too! Knowing how and when to bow properly for each potential social or business scenario is critical for success. Committing an etiquette faux pas at the wrong time can potentially destroy a business deal. No need to feel awkward: with a little practice, you'll be giving and returning bows in Japan without even thinking about it. Doing so becomes reflexive after traveling in Japan some time. During first-time meetings, many Japanese will avoid an awkward situation by offering to shake hands with Westerners instead. In formal settings and business engagements, sometimes a combination of handshakes and bows will ensue. Simply follow your hosts' lead as to which comes first, however, you should certainly do your best to return a bow if one is offered.​ Your hosts are undoubtedly skilled at helping others save face and will try not to put you into a position of embarrassment. Regardless, showing effort and that you know something about bowing etiquette goes a long way for relationships. While shaking hands is still relatively rare between Japanese, doing so has come to symbolize a strong relationship — a deeper connection than what Westerners assign to casual handshakes. Some executives make it a point to shake hands after announcing a large deal or high-profile merger between two companies. Both bows and handshakes are used in business and formal meetings. Avoid the common newbie mistake of bowing when the other party planned to only shake hands, as President Obama did before the Emperor of Japan in 2009. You can avoid any potential embarrassment by expressing your intent to bow. If the other person has their hand extended to shake, don't begin a bow instead! The reasoning is that solid eye contact is expected during a handshake, however, the gaze should be down during a proper bow. Only martial artists should maintain eye contact during a bow! President Obama erred slightly during the meeting by bowing too deeply while at the same time shaking hands, making it look as though he were submitting before the Emperor of Japan. Tip: If a bow-shake occurs, you'll undoubtedly be in close proximity. Bumping heads isn't a way to make friends, so the practice is to turn slightly to your left. The correct way to bow in Japan is to bend at the waist, keep your back and neck straight, feet together, eyes downward, and have your arms straight at your sides. Women often bow with their fingertips together or hands clasped in front at thigh level. Face the person whom you are greeting squarely. Bowing with a briefcase or something in your hand is OK, putting it down first is optional. You should, however, receive someone's business card — if one follows the bow — reverently with both hands. The deeper the bow and the longer it is held, the more respect and submission are shown. A quick, informal bow involves bending to around 15 degrees, while a more formal bow calls for you to bend your torso to a 30-degree angle. The deepest bow involves bending to a full 45 degrees while you look at your shoes. The longer that you hold a bow, the more respect is shown. In general, you should bow more deeply to superiors, elders, people of rank or office, and anytime the situation demands additional respect. Remember to look down as you bow. Pick a spot on the floor in front of you. Maintaining eye contact while bowing is considered bad form — threatening, even — unless you are squared to fight an opponent in martial arts! Sometimes you may find yourself bowing more than once until someone finally relents and stops the ritual. If you are forced to bow in a crowded situation or cramped space, turn slightly to your left so that you don't knock heads with others! After exchanging bows, give friendly eye contact and a warm smile. But ideally, try not to combine a bow (requires eyes to be downward) with a handshake (eye contact is expected). Bows of sincere apology are usually the deepest and last longer than other bows. In rare instances, to express profound apology or gratitude, bend beyond 45 degrees and hold it for a count of three. Long bows beyond 45 degrees are known as saikeiri and are only used to show deep sympathy, respect, apology, and in worship. If you are granted an audience with the Emperor of Japan, plan to perform a saikeiri, otherwise, stick to bowing at 45 degrees or less.